DOVER, Del. – Much to the dismay of Matt Crafton, Johnny Sauter, Ryan Blaney and others, Kyle Busch has been unstoppable in the NASCAR Camping World Truck Series and untouchable at Dover International Speedway. Busch, won for the fourth time in as many 2014 starts and posted his third victory in his last three NCWTS attempts at Dover, leading 150 of 200 laps to capture Friday’s Lucas Oil 200. As a regular in the NASCAR Sprint Cup Series, Busch is not eligible for the Camping World Truck Series title. But he’s driving like a champion. In addition to his 39th victory, he recorded the eighth perfect driver rating of his CWTS career in Friday’s race. It all begs the question: Might Busch be able to finish unbeaten in the truck races he drives this season? Turning the duties over to rookie Erik Jones for five of the next six races, Busch isn’t slated to drive another CWTS race until June 26 at Kentucky. “It’s been fun. I’ve enjoyed being able to run up front, lead laps and such,” Busch said. Busch has now won five consecutive starts dating back to last season, the second time in his career he has accomplished the feat. Crafton provided Busch’s stiffest competition until his right front tire gave out, leading to a hard crash on Lap 158. That left it to Blaney and Sauter to pursue Busch after a restart with 20 laps to go. But once Busch pulled away, neither could close to within 1.3 seconds of the leader. 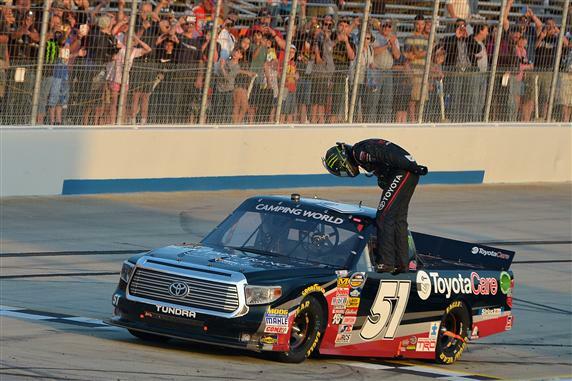 “Our Tundra was awesome on the long runs,” said Busch’s crew chief Eric Phillips. Blaney lost ground on a pit stop late in the race, but knew that was not the deciding factor. Crafton, who entered the race as the series points leader, said he had “no warning” his right front tire was about to go down. “It’s a shame,” said Crafton, who led 46 laps. Relegated to a 23rd-place finish by his crash, Crafton dropped into a second-place tie with Sauter, one point behind Timothy Peters. With his victory at Martinsville Speedway, Crafton remains the only driver other than Busch to win a CWTS race this season. Peters emerged with the series lead despite losing power and finishing 10th, two laps down. His Red Horse Racing teammate German Quiroga Jr., lost a late-race duel with Tyler Reddick for eighth place, but remained the only driver to finish in the top 10 of each race this season. After leading the first 73 laps, Busch did have to overcome a bad break. He was already on pit road for a green flag stop when Brennan Newberry crashed into the inside retaining wall. Busch continued back onto the track without pitting but fell to eighth place on the restart. That handed the lead to Crafton and helped Blaney, Reddick, Sauter and John Hunter Nemechek advance within the top five. Busch wasted no time in charging to third. He passed Blaney during a lengthy green flag run and closed to Crafton’s rear bumper. On Lap 120 Busch rode the high line to regain the lead. Brandon Jones raced with the leaders all night and posted a career-best fourth-place finish. Joey Coulter was fifth, his best finish of the season. Ben Kennedy finished behind Nemechek, his seventh-place finish the best by a rookie. Busch, who qualified on the front row for Sunday’s Sprint Cup race, has a chance to complete a rare triple this weekend. He has won two of his last three Nationwide Series starts and had the fifth-fastest lap time in final practice for Saturday’s Buckle Up 200 presented by Click It or Ticket Nationwide event. 1. (1) Kyle Busch(i), Toyota, 200, $40815. 2. (14) Ryan Blaney, Ford, 200, $32830. 3. (6) Johnny Sauter, Toyota, 200, $22996. 4. (29) Brandon Jones, Chevrolet, 200, $17595. 5. (17) Joey Coulter, Chevrolet, 200, $18020. 6. (7) John H. Nemechek, Toyota, 200, $15995. 7. (10) Ben Kennedy #, Chevrolet, 200, $16895. 8. (5) Tyler Reddick #, Ford, 199, $15295. 9. (4) German Quiroga, Toyota, 199, $14590. 10. (3) Timothy Peters, Toyota, 198, $15640. 11. (8) Ron Hornaday Jr., Chevrolet, 198, $14140. 12. (11) John Wes Townley, Toyota, 198, $13865. 13. (26) Scott Riggs, Ford, 198, $13765. 14. (28) Cole Custer, Chevrolet, 197, $11415. 15. (20) TJ Bell, Chevrolet, 197, $13965. 16. (15) Darrell Wallace Jr., Toyota, 195, $13890. 17. (27) Tyler Young #, Chevrolet, 194, $13365. 18. (12) Jeb Burton, Toyota, 189, $13265. 19. (23) Justin Jennings, Chevrolet, 183, $13165. 20. (19) Jennifer Jo Cobb, RAM, 180, $13690. 21. (13) Gray Gaulding #, Chevrolet, Accident, 172, $12965. 22. (9) Ben Rhodes, Chevrolet, Accident, 169, $11615. 23. (2) Matt Crafton, Toyota, Accident, 156, $12515. 24. (35) Ryan Sieg(i), Chevrolet, Suspension, 136, $10415. 25. (21) Bryan Silas, Chevrolet, Engine, 127, $10465. 26. (24) Mason Mingus #, Toyota, 125, $10215. 27. (16) Brennan Newberry, Chevrolet, Accident, 74, $10115. 28. (22) Norm Benning, Chevrolet, Too Slow, 55, $10015. 29. (25) Jake Crum, Chevrolet, Engine, 52, $9890. 30. (18) Jimmy Weller III #, Chevrolet, Engine, 18, $10290. 31. (32) Raymond Terczak Jr., Chevrolet, Rear Gear, 14, $9690. 32. (31) Charles Lewandoski, Chevrolet, Electrical, 3, $9590. 33. (34) Todd Peck, Chevrolet, Overheating, 3, $9565. 34. (30) Ryan Ellis(i), Chevrolet, Vibration, 2, $9490. 35. (33) Blake Koch(i), RAM, Vibration, 2, $9460. Average Speed of Race Winner: 102.389 mph. Time of Race: 01 Hrs, 57 Mins, 12 Secs. Margin of Victory: 2.123 Seconds. Caution Flags: 7 for 38 laps. Lap Leaders: K. Busch(i) 1-73; M. Crafton 74-80; R. Blaney 81; M. Crafton 82-120; K. Busch(i) 121-159; B. Jones 160-162; K. Busch(i) 163-200. Leaders Summary (Driver, Times Lead, Laps Led): K. Busch(i) 3 times for 150 laps; M. Crafton 2 times for 46 laps; B. Jones 1 time for 3 laps; R. Blaney 1 time for 1 lap. Top 10 in Points: T. Peters – 185; M. Crafton – 184; J. Sauter – 184; G. Quiroga – 179; R. Hornaday Jr. – 170; B. Kennedy # – 169; R. Blaney – 166; J. Townley – 159; J. Burton – 153; J. Coulter – 142.